Sclerotherapy is considered the gold standard for the treatment of varicose veins. During the procedure, a solution is injected into the vein, which causes it to close up and fade away. 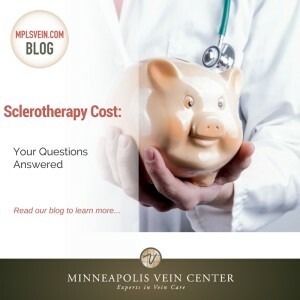 Before your treat your varicose veins, learn more about sclerotherapy costs at Minneapolis Vein Center. Sclerotherapy costs will vary due to differences in insurance coverage. Sclerotherapy treatments that are considered cosmetic are not typically covered by insurance and must be paid for out-of-pocket. You’ll find that the cost of sclerotherapy at Minneapolis Vein center is locally competitive and provides high value for your money. On average, most patients require two sessions. The number of sessions needed is determined by the Nurse. Some patients may require one full session followed by a touch up, which is a fraction of the cost of a full session. Touch up sessions can be scheduled 6-8 weeks after the initial session. Full sessions last approximately 45-60 minutes. Touch up sessions last approximately 20-30 minutes. The cost of cosmetic sclerotherapy treatment is rarely covered by insurance. However, sclerotherapy costs may be eligible expenses in some flexible spending accounts. Check with your individual insurance plan about your coverage. WHAT MAKES MVC DIFFERENT FROM OTHER VEIN CLINICS IN MINNEAPOLIS? At Minneapolis Vein Center, you get the most for your money with high quality vein treatments and expert care. Free screenings allow patients to learn about treatment options and fees upfront with no obligations or sales pressure. And each full session lasts 45-60 minutes, compared to 15-30 minutes with other vein clinics or limited to one leg/area at a time. To learn more about the varicose vein treatment that is right for you, schedule your free screening with Minneapolis Vein Center. Our vein experts will help you understand the process, costs, and results you can expect from your treatment.